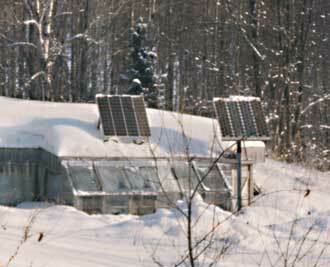 We're thoroughly involved with the sun and wind on our sustainable "green" homestead in Michigan's Upper Peninsula. 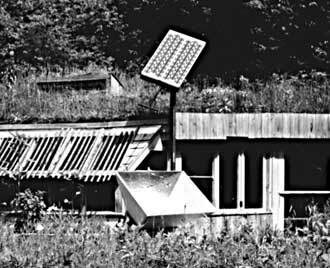 From PV (photovoltaic or solar) panels to a water pumping windmill; from a solar oven to a solar food dryer. 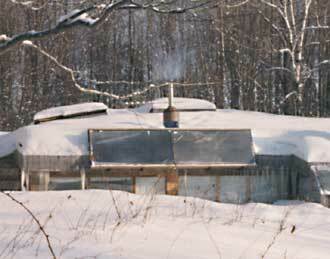 Our home is heated with hot-air solar panels and a wood-burning woodstove. To say we have a close relationship with the Sun is a bit of an understatement! 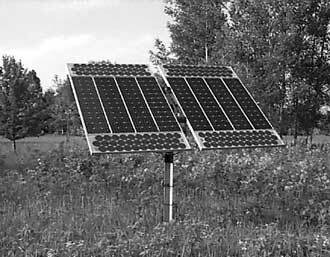 Using solar energy sources is not an abstract theory or a fad, it's a wonderfully fun way of living. 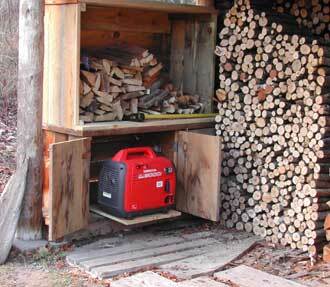 Our system started small and has grown over the years but always it's provided us with power for our needs and wants. I expect it will keep growing as we do. Here we'll take you on a brief tour of the evolution and current state of our solar electric system. 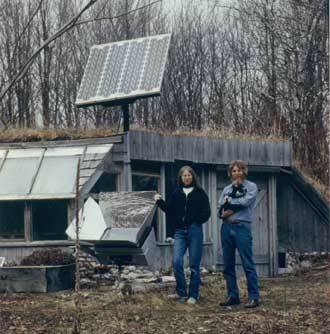 If you've read "Homesteading Adventures" (which was written in 1996) this is an update to the chapter Power for the People - The Sun and Solar of Electricity. Our system has grown a bit since then! 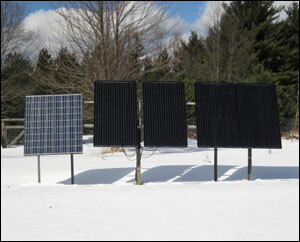 For information on other solar aspects of our homestead, check out the many articles in the Homestead section. Things in our life sure do change and grow! 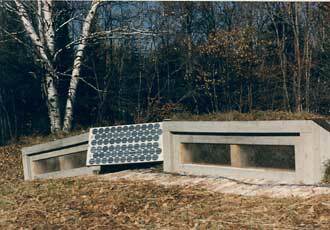 1983 - Our first solar electric PV panels! 1997 - the trees in front of the house grew (surprise!) so the array had to move. Might as well add a few more panels while we're at it. 2015 - Four 250-watt Solar World panel plus two Kyocea 135-watt panels for a total of 1,135 watts at 24 volts. 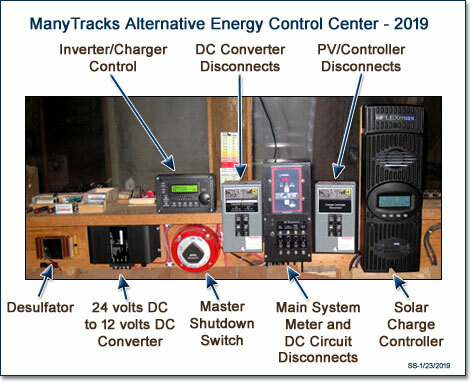 It turns out that the real culprit causing our charging problems last summer and fall was probably the settings on a home-made diversion controller. 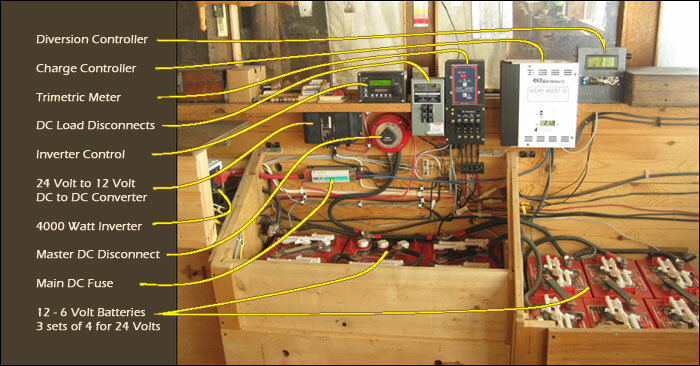 It was set up to divert power to some heating panels in the house whenever the Solar Boost controller was in absorb or float modes. This was incorrect as it prevented the batteries from ever getting fully charged. I have reconfigured the diversion controller so it now interfaces properly with the new controller's aux. mode relay. The heaters come on only when both 1) the Outback controller is in float mode and 2) the battery voltage is above 27 volts. 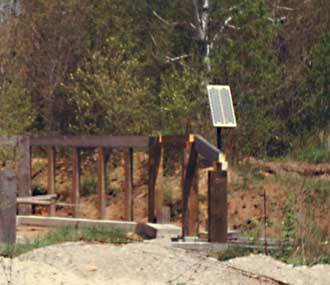 The batteries are now fully recharged any day there is a few hours of full sun; lately, nearly every day. Battery capacity seems to be slowly coming back to more acceptable levels. THE print source on alternative energy; it was the first and is still the best. 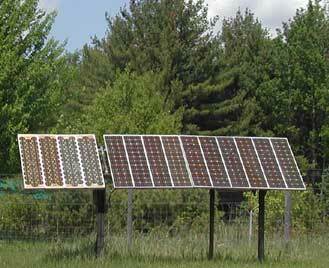 MREA is responsible for the largest and oldest renewable energy fair the third weekend in June (Solstice Weekend). Highly recommended if you are at all interested in alternative energy or alternative lifestyles and ideas. Good folks, good information, good prices. We've dealt with them for many, many years and send people to them regularly. Check them out. "Homesteading Adventures -A Guide for Doers and Dreamers"
Enjoy these articles and want to help support the website? Feel free to leave a tip!